A tree introduced from Europe and locally naturalized, especially on shores and banks. First collected in 1881 in Washtenaw Co.
Plants with conspicuous yellow first-year twigs have been called var. vitellina (L.) Stokes, the Golden Willow, or var. tristis (Ser.) Gaudin (with “weeping” habit). This hybridizes extensively with S. euxina, producing S. ×fragilis (S. ×rubens of Michigan Flora), intermediate in character or showing some of each species (e.g., the serrations of one with the pubescence or capsules of the other). This hybrid appears to be relatively frequent and collections apparently intermediate or at least not assignable to either S. alba or S. euxina have been seen from several counties in addition to those from which one or both species are mapped: Benzie, Eaton, Genesee, Gladwin, Ingham, and Tuscola. See also the discussion under Salix euxina. MICHIGAN FLORA ONLINE. A. A. Reznicek, E. G. Voss, & B. S. Walters. February 2011. University of Michigan. Web. 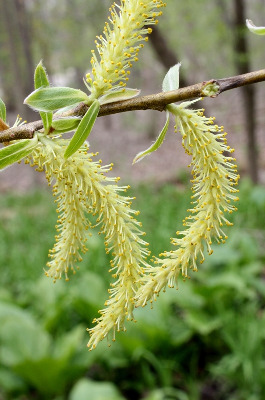 April 18, 2019. https://michiganflora.net/species.aspx?id=2618.